Miss-Denise features in the Yahoo Time Capsule! Click on the Photo to go directly to the complete Yahoo Time Capsule - Enjoy! 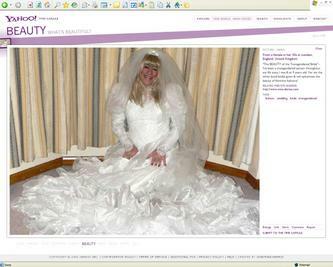 Well your musical mistress is proud to be featured as a Transgendered Bride in the BEAUTY Section of the official Yahoo Time Capsule which was completed on the 8th November! I'm really excited to be almost the sole transgendered representative in this historical capsule that will be preserved at the Washington DC based Smithsonian Institute! I guess that social research professors in 100 years time will wonder "Who was Miss-Denise?!" and why is she wearing such a beautiful bridal gown! Anyway, I also gave a link to www.miss-denise.com so with luck there will be historial archives on sites like www.archive.org that will answer such questions! I really would encourage other T-girls to submit their photos, stories and videos to future time capsules so that in the 22nd century we are seen to be the seeds of an "officially accepted" 3rd social gender. To be honest it is disappointing that out of more than 151,000 approved submissions in the Yahoo Time Capsule that only 5 are transgendered related in any sense at all That's just 0.003% - Are we really such a small social minority - I don't think so!!! Maybe then we'll get questionnaires that ask us whether we're male, female or transgendered !